Horizon scanning and futures workshop disciplines and models facilitated by our experienced Partners help our clients to capture the insights and judgements of their own staff. Programs – What is futures scanning? We work as partners with our clients around the world, conducting in house futures scanning programmes for them, collecting weak signals, to identify potential change factors, challenging their assumptions about the future in a series of futures workshops designed to anticipate different possible futures for their organisation. We structure and conduct the process with them, build their own foresight competence to address their particular interests and concerns. We help to broaden their perspective on the future with our network of experienced participants and build participation across their organisation in futures thinking to inform their strategic direction. Programs – How does futures scanning work? Projects – When can we help you avoid risk? The past few years have been as turbulent as any experienced in the lifetime of most people at work today, and systemic risk is higher than ever for highly connected organisations. Now that the world’s business community is beginning to understand why a complex global system is inherently unstable, it is imperative to look for ways of developing the resilience to cope with such turbulence. Few organisations have taken steps, at the highest level, to challenge their assumptions about the future, on which their business continuity depends. None can foresee the future, but all can attempt to understand how their own assumptions about the future may be vulnerable to the unexpected. Horizon scanning can provide the early warning that organisations need to assess the impact of the unexpected. It can identify risks in advance and offer the opportunity to assess the impact these might have before they are actually encountered. Projects – When can we help your innovation process? The need for innovation is widely accepted but rarely foreseen in time to anticipate the prospect of change. 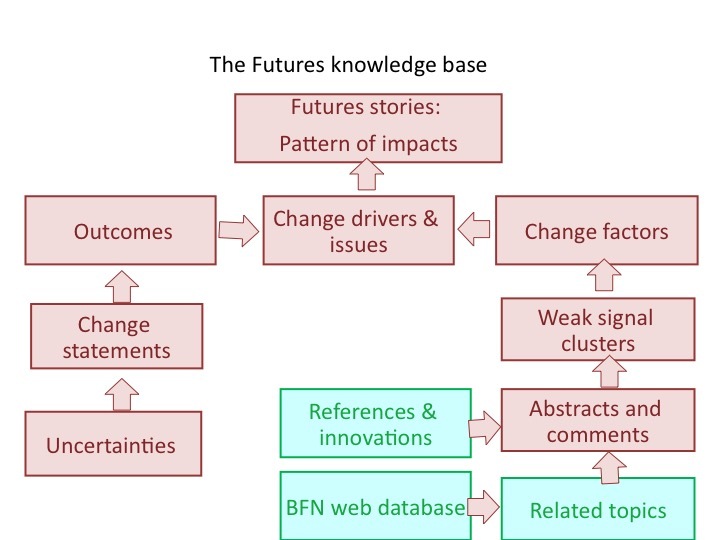 Foresight affords an organisation the time to address future change. Innovation is challenging to the status quo and to those whose fortunes it embraces. For many organisations that means those in authority will not tolerate dissenting views of the future, except when foresight is delivered independently. Innovation is by definition disruptive, only the degree varies, both in terms of scale and timing, yet procedures for managing innovation frequently delay or diminish its impact, by failing to recognise the prospect of decline, which dispassionate foresight can help to anticipate. Innovation is the product of seeing things differently, doing things differently or just being different, and diversity of perspective and outlook is a key attribute of foresight practice, which challenges the dominance of expert opinion. Programs and Projects – What is our track record? We are one of the most experienced practitioners of foresight, having both pioneered the use of horizon scanning and developed a workshop-based model that helps organisations capture the insights and, crucially, the judgement of their own members. Our futures workshop process has been tried and tested throughout the world and for many different organisations. The quality of facilitation, the spirit of mutual respect for new ideas, our willingness to be wrong and respect others’ points of view and the futures experience of our network members are all crucial aspects of its success. Our record in expressing different views of the future can be judged from the themes we have identified, whose currency belies their heritage. Foresight creates a long-term perspective on change.